Can't decide whether you want cookies or brownies? We don't blame you - they're both fantastic. This gift box comes loaded with (8) incredible gourmet cookies and three of our BIG Chocolate Brownies. Both are made from 100% organic whole wheat pastry flour, AA grade butter, farm fresh eggs and pure cane sugar. No additives, preservatives, extenders or other such nonsense in these incredibly delicious homemade treats. Just add milk and enjoy! (8) cookies and (3) brownies sealed in cello bags for freshness. This box is made from 100% recycled materials. 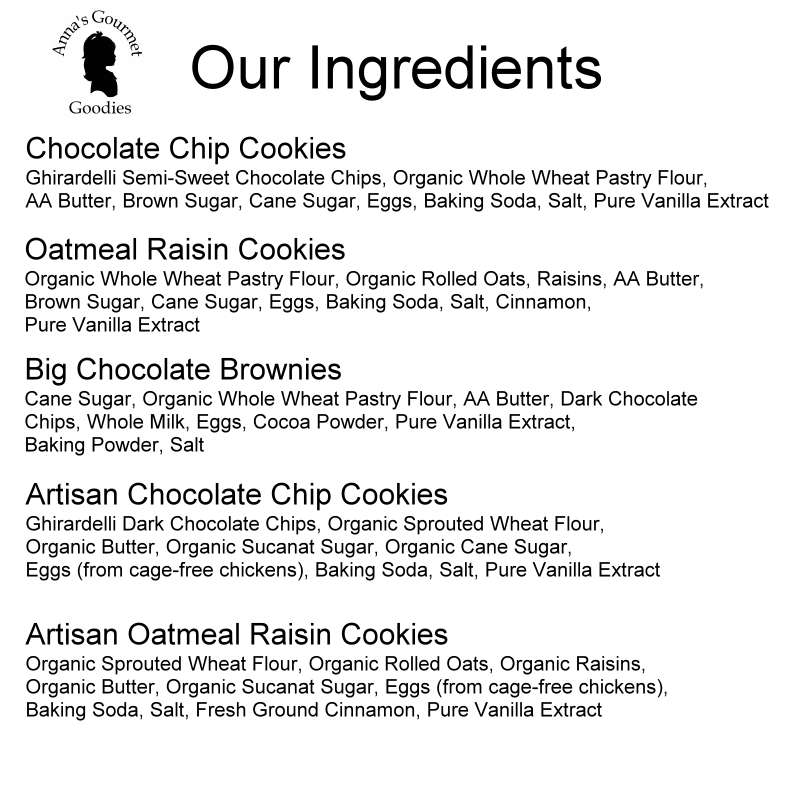 Loved them all- chocolate chip cookies, oatmeal raisin cookies, chocolate brownies. Quality and care show in the baking and packaging. I can't say enough about this company and their desire to put out a quality product. I called to check on delivery time for a gift and found an extremely service oriented company. I will be ordering again! We had tried other cookie maker products, but we had not tried Anna's though we have sent Anna's gift boxes to others. We found Anna's packaging and their cookies and brownies to be superior. Absolutely delicious. I will definitely purchase again.